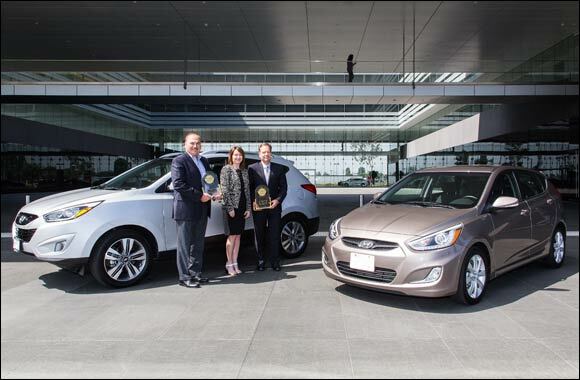 July 5, 2015 – Hyundai has reaffirmed its position as one of the world’s leading automotive manufacturers thanks to prestigious awards from international awards body J.D. Power. As part of the company’s 2015 Initial Quality Study which surveyed 84,000 customers, the Hyundai Tucson and Accent have been reported fewer problems with their vehicles than any other small SUV or small car, respectively. IQS, now in its 29th year, serves as the industry benchmark for new-vehicle quality measured at 90 days of ownership. In total, Hyundai had four models ranking in the top two in their segments, including segment awards for Tucson and Accent, and second-place finishes for Elantra and Santa Fe. The Hyundai overall score was 95 problems per 100 vehicles, 17 problems fewer than the industry average. The 2015 Hyundai Tucson was awarded for the highest initial quality in the small SUV segment and the 2015 Hyundai Accent earned the highest honour in the small-car segment for the second year in a row. This year’s results mark the fourth time Hyundai has finished among the top four brands overall. The 2015 IQS is based on responses from more than 84,000 purchasers and lessees of new 2015 model-year vehicles surveyed after 90 days of ownership. The study is based on a 233-question survey designed to provide manufacturers with information to facilitate the identification of problems and drive product improvement.